Bergalia Farm or Breakout River dry-aged fresh body grass-fed beef. Average 15-20mm steak weight is 170-240g. Buy bulk and SAVE! 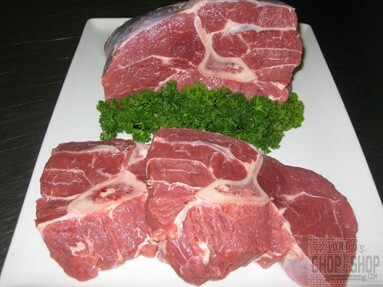 Bone-in or oyster blade is a good all rounder. It can be used for kebabs, steaks, stir-frys, curries, casseroles and slow cookers and much more. We find it generally under-rated as a steak or or roasting meat which makes it good value for these types of cooking. Little known fact - When bone-in blade meat is slow roasted or slow cooked it becomes super tender and falls off the bone. Thats why it's preferred by many Butchers and Chefs over more expensive cuts, not just because of it's great value. Jordo's tip - Season a whole bone-in oyster (try one of our free seasoning glazes or coatings) and roast in a Webber or hooded BBQ. The blade roast's top fat has a tendency to capture the smokey BBQ flavour and a thin piece of connective tissue that runs through the roast breaks down and liquifies which keeps the roast succulent on the inside.